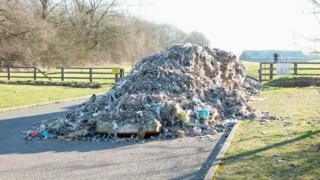 The mound of processed residential rubbish was left at the entrance to the field at Bishop's Stortford High School, Hertfordshire, between 18 and 19 February. Head teacher Dale Reeve called it an "irresponsible" act of "vandalism". Mr Reeve said: "It is obviously a saddening and very frustrating situation. Not only does this incredibly irresponsible action have an environmental impact, it will also cost the school thousands of pounds to have it safely removed. "To have to spend a large sum of money on this act of vandalism, instead of on valuable educational resources, is extremely disheartening." Hertfordshire Police said it was exploring "all lines of inquiry". Referring to the incident in Barwick, Sgt Duncan Wallace said: "This was an organised operation involving the dumping of processed waste. To gain access to the site a padlock was cut off a gate with an angle grinder." Graham McAndrew, executive member for waste at East Herts District Council, said a council officer would always attend incidents like these to "try and find evidence for prosecution". Hertfordshire police and crime commissioner David Lloyd said: "The scale and audacity of this crime is shocking. "There should be severe penalties for the offenders when they are brought to justice."